The flag of India features a spinning wheel in the center, which was first proposed by Mohandas Gandhi in 1921. This was meant to reflect the self-sufficiency of the Indians who used spinning wheels to create their own clothing. Of course, the design of the wheel has changed throughout history but it still remains today. The white stripe of the flag was chosen to create a background to make the wheel stand out. There is a total of three bands of colors, representing courage, sacrifice, peace, truth, faith and chivalry. 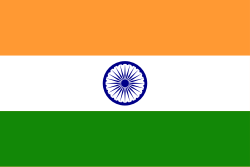 The flag of India features a blue spinning wheel in the center. The background is composed of three colored bands of the same size. From the top down, the colors are saffron, white and green. Saffron was chosen to represent courage and sacrifice. White was selected to represent peace and truth. Faith and chivalry are represented by the lower band of green. Before the Indian Independence Movement, multiple flags were used throughout the country. It was after the 1857 rebellion that British rulers determined that a single flag should be flown. The original flag was very different from what it is today. It was very similar to other flags of British colonies and featured a blue background with a Union Jack in the upper left quadrant, or “canton,” and a Star of India with a royal crown on the right side of the flag. A new flag was introduced in 1905 and was first raised just two years later. This flag was designed as a way to unite all castes and races. It had three bands of green, yellow and red making up the background, eight white lotuses to represent the eight provinces, a sun and a crescent, and a Hindi slogan. However, many people in India were not enthusiastic about the flag, so in 1916, thirty new designs were submitted. However, none of these were adopted, although people continued to talk about the importance of having a national flag. It was in 1921 when Mohandas Gandhi proposed a design that is similar to the one that is used today. It wasn’t until 1923 when a flag based on Gandhi’s proposal and designed by Pingali Venkayya was hoisted. In 1931, a slightly redesigned flag was adopted by the Indian National Congress. The current flag was adopted in 1947. Indian flags must be created using hand-spun cloth known as khadi. Anyone that flies a flag not made of this material will be fined and could also receive up to three years of jail time. The khadi used to create flags must be made of cotton, wool or silk. Only four places in India are licensed to make the cloth that is used for flags. The material used to craft Indian flags is sent to a laboratory for testing. Once quality is approved, it is returned to the factory where it is dyed saffron, green and white, and the design is either printed, embroidered or stenciled onto the flag. The spinning wheel featured on the modern flag is known as the Ashoka Chakra. It is navy blue in color, and it features 24 spokes.